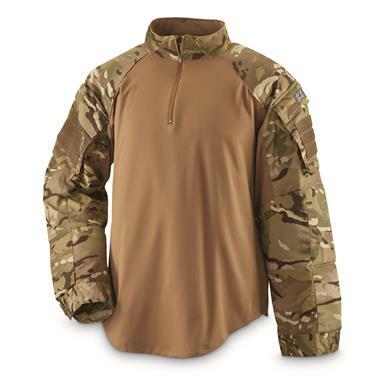 British Military Surplus UBAC Long Sleeve Combat Shirt, New is rated 4.3 out of 5 by 3. Rated 4 out of 5 by MVDU from Nice shirt, could fit better This is a nicely built shirt, comfortable and well padded with big rubber patches, saying that sizing runs on the large size is an understatement, I normally wear L and ordered an M, quite honestly an S would have been better. The sleeves adjust with buttons and are too wide at the wrist, length is perfect allowing to flex the arm and not retracting much.Being a military surplus item the Unin Jack on the left side is a nice detail.However, this is not designed to be a fashion statement and for its purpose it's functional and adequate. Lastly, the sale price was fantastic, until I noticed it went further down!